Recently I had the opportunity to visit the Evangelical Lutheran Church in Jordan and the Holy Land (ELCJHL) for their annual meeting of The Coordination Committee for Co-Operation between the ELCJHL and their overseas partners. 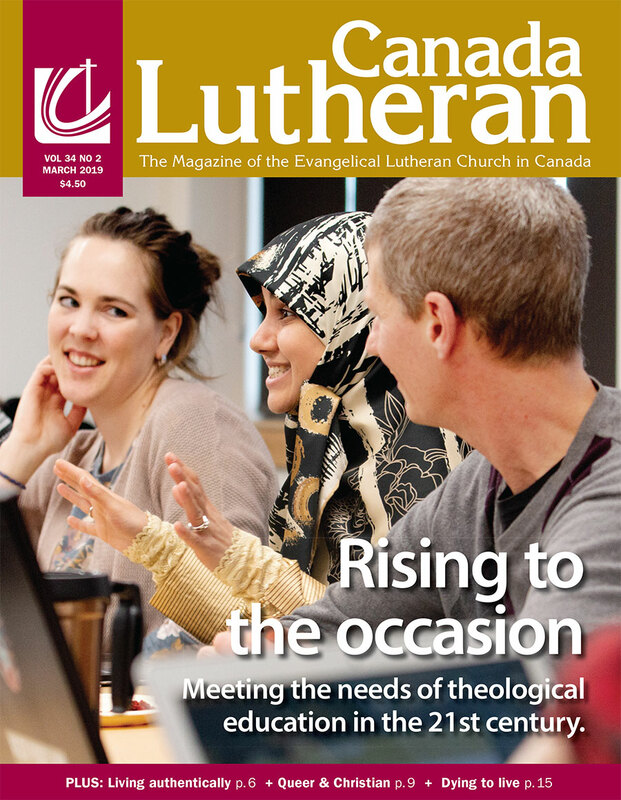 The Evangelical Lutheran Church in Canada has been a partner of the ELCJHL since 1999. I always come away from the meetings both saddened and excited. Saddened, because every year there is additional evidence of the hardship of life for the Palestinian people: more people talking about leaving the area due to the hot political climate, the economic challenges, and an increasing sense of hopelessness. This is the reality of life under occupation. At the same time, I come away excited because of the commitment of the church to speaking a word of hope in the midst of challenging circumstances. Here is their understanding of mission. Although the ELCJHL is a minority church we do not have a minority complex. Rather, we consider ourselves to be salt in the society, as God calls us to be. For this reason we seek to serve our Palestinian people through education that aims to provide Christian evangelical in- struction, quality training and peace education. The ELCJHL is called to serve the marginalized, the elderly, those who suffer or are traumatized and all who are in need—regardless of race, gender or political affiliation. The ELCJHL empowers youth, women, men and children, encouraging all our baptized members to be the people of God in service and witness. The ELCJHL ministers with the other 12 churches of the Holy Land. Together we promote unity, make a joint witness and seek to speak with a prophetic voice against any kind of injustice or any violation of human rights. The ELCJHL is a catalyst for a just peace, working as bridge builders among the nations. We seek to be brokers of justice, ministers of reconciliation and apostles of love. The ELCJHL, with the other churches, seeks to live and witness within a Muslim world and seeks to create a paradigm of Christian-Muslim relations. The ELCJHL, with the other churches, seeks also to live with Jews in a just and equitable coexistence. The ELCJHL engages in interfaith dialogue, seeking to cooperate positively for a just peace throughout the Middle East. The ELCJHL is the local expression of the Lutheran communion worldwide. It works in partnership and companionship with other Lutherans who have come to the Holy Land and with Lutheran Churches and agencies throughout the world. I love that the ELCJHL acknowledges that it is a minority church but does not have a minority complex. This is something I aspire to for our church. The ELCJHL has six congregations, four K-12 schools, a pre-school and an environmental education centre. It has active ministry for youth, women and the deaf. It is a small church that has a large footprint. This year’s meeting of the Coordinating Committee was under the theme Behold, I am doing a new thing (Isaiah 43:19). God is calling the ELCJHL into new territory. God is calling our church into new territory as well. My prayer is that we will answer that call with the same sense of hope and commitment that I experience in the life of our partner.